This Erasmus+ funded project developed high quality learning opportunities tailored to volunteers returning from placements in the global south, to upskill them as active citizens on international development issues. Utilising innovative outreach and delivery methodologies, it aimed to nurture the transformative potential of these people’s overseas experience and translate it into a deepened sense of identity as active global citizens. Individual participation, whereby individuals’ choices (such as choosing fair trade goods) impacts on society. How can we support volunteers’ active citizenship? Many volunteers return from their placements with an informed perspective on the major global challenges that humanity is facing. However, they can also feel a little lost or unsure of how to get involved in working to address these. 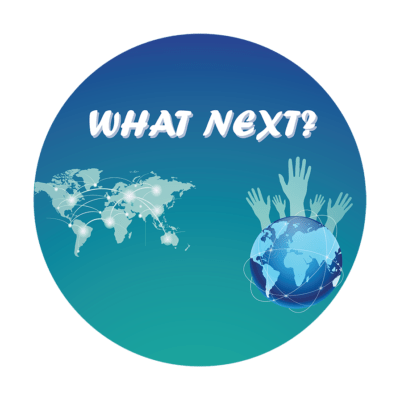 To help organisations strengthen their practice in promoting volunteers’ continuous engagement, we developed a four-stage training manual called “What Next? A training resource for working with returned volunteers”. This focuses on enhancing skills that were ignited while overseas, such as critical thinking, community participation, and strategies to address global justice questions. You can read this immediately below. For organisations working specifically in Ireland, this manual has been adapted for the Irish context and you can access that here. The project has also developed a resource that is specifically for facilitators and trainers working with returning volunteers. This training companion focuses on examining how a truly critical learning process can be promoted with volunteers, with a view to encouraging facilitators to dig deeper into their practice as trainers. Below are some training course that were run across Europe as part of the Volunteering for the Future project. The training courses used the methodology developed in the training manuals, both with returned volunteers and with people that work with returned volunteers and development workers. The course brought together 36 participants from 4 different countries in Europe (Ireland, UK, Czech and Germany). All participants lived and worked/volunteered in the global South at some point. The course looked at ways participants could take the learning from this experience into their lives and communities in order to work on social justice issues. This training was an invitation for practitioners to ‘step out’ of their practice and reflect on what they are doing in their training role. The course offered an opportunity for participants to review their practice with a view to ‘stepping back in’, equipped with a deeper sense of the complexities of training and context within which they are working.